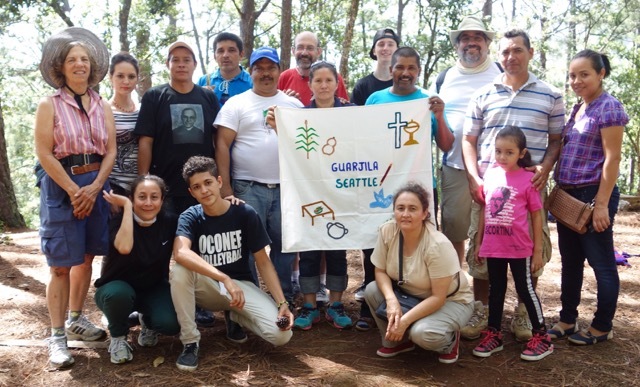 When a group travels from Seattle to Guarjila, El Salvador, or comes from Guarjila to Seattle, we call it a delegation. Most of the delegations are from North to South, as was this summer’s. Five of us, Tom Pouliot, Windsor Goble Van Diest, Rev. Christy Fisher, Nikki Nichols, and Bruce Sherman, traveled to El Salvador during the last 10 days of June. This year’s delegation was small, but we were very enthusiastic. 4 of the 5 of us had been on a previous delegation, and we were excited to by joined by Rev. Christy Fisher from the University of Washington’s Wesley Club. She came along to see if having the Wesley Club participate in future delegations might be possible. Be sure to ask Christy, when you see her, just what she thought of the experience. She appeared to be having a pretty good time, and we certainly enjoyed her presence on the trip. We flew down to El Salvador on a Saturday morning (really early on a Saturday morning) and arrived in the late evening to the airport near San Salvador. We were met by Julieta and Carrie, as well as Marleny and Felipe from Guarjila. Carrie is the Central American Director of Sister Parish, and Julieta is the El Salvador representative who acts as our main liaison with Guarjila. Julieta has been to Seattle on a South to North delegation, and she and Carrie are excellent interpreters for us during our time in Spanish speaking El Salvador. 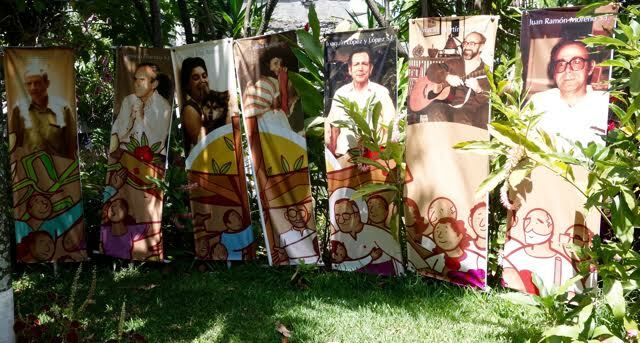 Commemorating the priests and two women assassinated at the University of Central America. We spent a couple of days visiting historical sites in San Salvador, and attended mass at the Catholic Cathedral. We worshiped downstairs where the people’s mass is held, and where Archbishop Romero in entombed. The other places we visit in San Salvador are places where significant events took place during the war of the 1980’s. It can be difficult to see places where real violence has taken place, but the experience of seeing these places, which symbolize the struggle that our friends here have lived through is an unforgettable one. These honored sites are very important for folks from Guarjila, and to be able to share with Marleny and Felipe was very meaningful. Visiting the Guarjila cemetery to remember and honor those who have passed. The road to Guarjila is getting shorter as better paving, and a more direct route, have made the journey much easier. Unfortunately, that road that brought us there so easily also brings influence and people from the city. 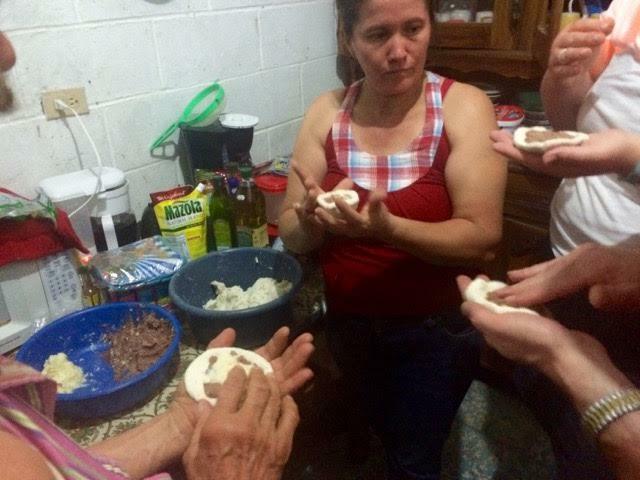 The gang problems that are so public in San Salvador are also being felt in this special small village of Guarjila…. Many, if not most people have a cellphone. There are satellite TV dishes on roofs all over town, and Internet access is available through the cell towers. While these things can bring advantages, they also bring problems. In spite of this and other problems, we found the people of Guarjila to be just as warm and welcoming as always. We visited with some folks that we had met in previous delegations, and got to walk the back roads of Guarjila. The Tamarindo organization was impressive for their work with young people, and Radio Sumpul is still going strong. Learning people’s history at La Montañona. We capped off our visit with a trip to La Montañona, where the clandestine radio transmitter was hidden during the war. The entire country was able to hear this beacon of hope from one of the tallest mountains in the area. Our drive, and then climb together up to the top of the mountain symbolized our solidarity with the folks in Guarjila. We travel with them, and we walk with them as we both have our journeys. We hope that we can be heard from the top of the mountain, and are blessed that we can speak our truth without fear of reprisal. We work with Sister Parish to ensure that this remains the case, both in El Salvador and here at home in the United States. This entry was posted in Delegations, El Salvador, North to South and tagged delegate reflections, delegations, guarjila, north to south, wallingford. Bookmark the permalink.